No question about it, this is a super fun card. With it’s smiling cartoon man, his tie casually slung over one shoulder. He’s got a beard, he’s got a huge brew…he reminds you of someone right? Maybe your brother perhaps? 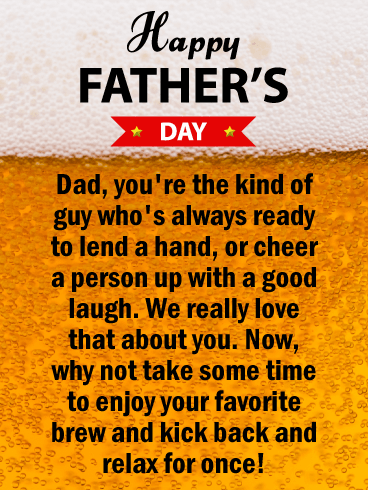 Send the Grab a Cold One Happy Father’s Day Card to put a big smile on your brother’s face this year! He works hard at being such a super dad and he deserves a beer. It’s always inspiring to watch someone who clearly loves being a parent. Your amazing brother raises his own children with such love and patience you can’t help but be impressed every time you see them together! 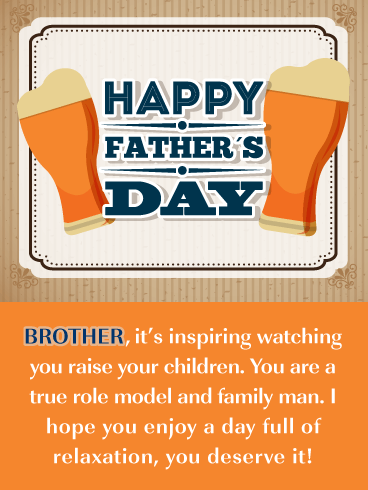 Send him the Role Model Happy Father’s Day Card to make that awesome dad’s day. He deserves a day of relaxation for all his hard work. Beers, err we mean cheers! 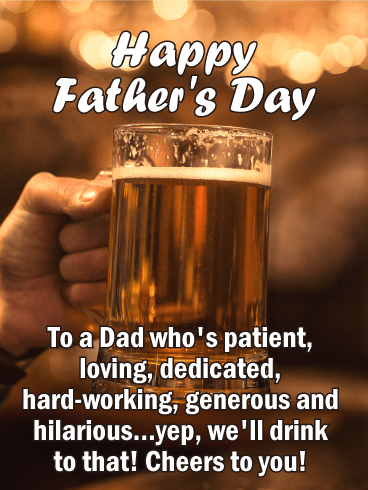 Cheers to fathers everywhere. 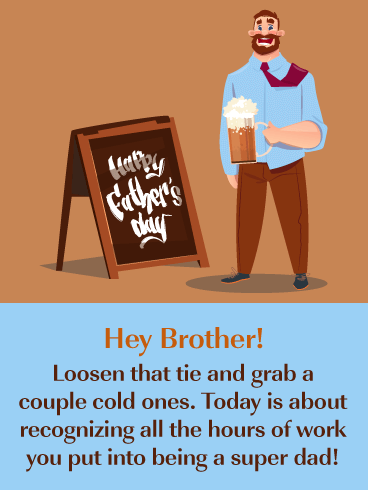 Don’t forget about your brother this Father’s Day, send that super fun guy the Cheers to Beers Card to let him know you’re raising a glass in his honor today. 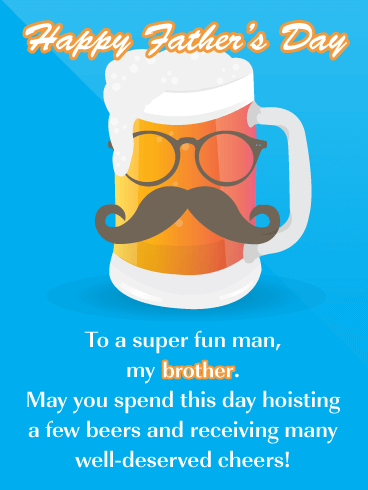 Featuring a frosty cartoon beer mug wearing a mustache and glasses, this card won’t fail to bring a smile to that gentleman’s face. 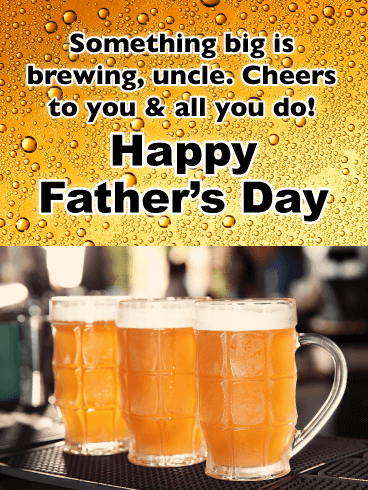 Is your uncle the ultimate beer lover? Or maybe he just enjoys kicking back and enjoying a few cold ones with family and friends. 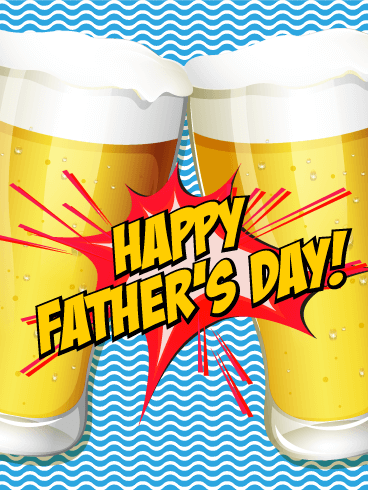 Whatever the case may be, this card will help brew up some fun for his Father’s Day celebration! Three frosty mugs sit waiting to be savored, and along with them comes your own personal toast to someone who’s pretty special. If your brother were a beer he’d be a craft beer. Sophisticated and smooth. 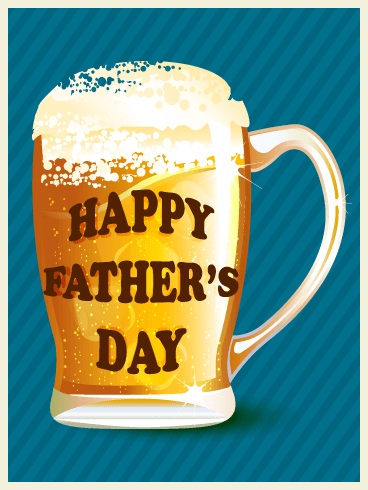 Send that class act the Love and Beer Happy Father’s Day Card to wish him well today. Let him know you think he’s amazing and you hope he gets to spend the entire day doing things he loves with the people who love him the most. For he's a jolly good fellow! Raise a pint to your old man! This Father's Day card from 'all of us' is full of good cheer. There is no one better to toast than the man who raised you and helped make you who you are today. 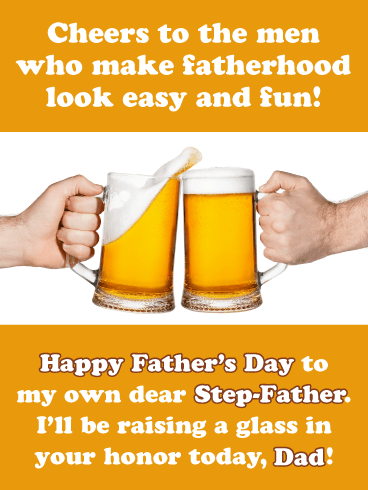 Tell your Dad he is one terrific guy with this cool and retro Father's Day greeting card. What do you love most about your Dad? This Father's Day greeting card is perfect for the Dad who you can always rely on to help you out or cheer you up! 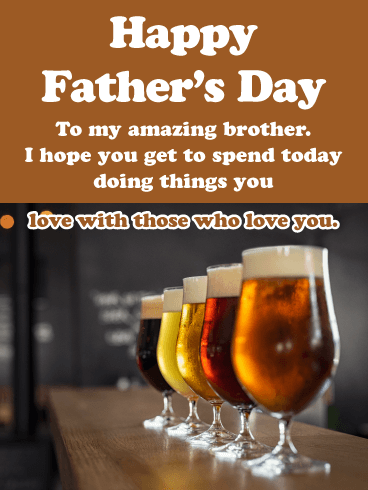 A good beer is a good way to enjoy Father's Day, so why not send your dad this Father's Day card to remind him to kick back and relax on his special day? Let's list all the ways your Dad is amazing! Ready? Let's go: he's patient and loving and super dedicated and hardworking; your Dad is even generous and on top of all that hilarious! We'll drink to that and so will you! 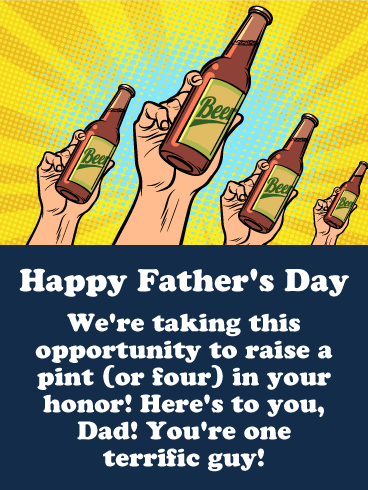 Raise a glass to your Dad when you send this fun Father's Day card. 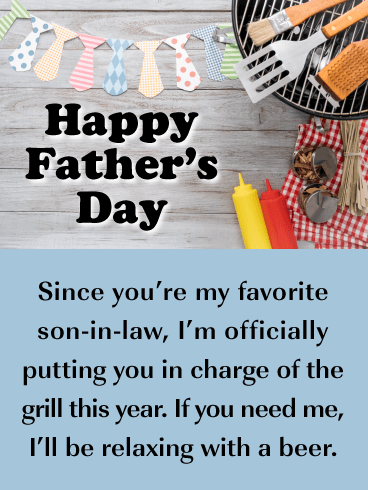 Don't forget to let your Dad know you're thinking of; this Father's Day greeting card is the perfect way to send him some love.